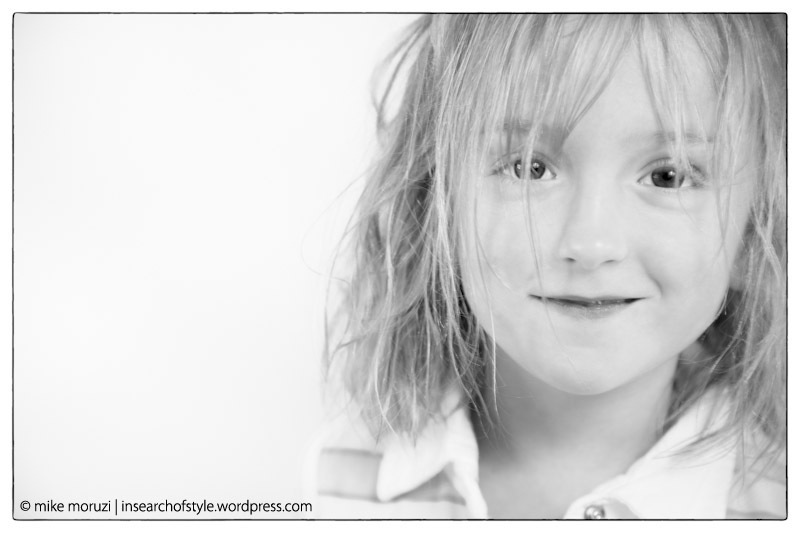 Haven’t done a portrait in a little while so here’s a post-swim-lesson-crazy-hair portrait of Mischief the Kid. Or maybe I should call her Giggles. Perhaps Tiny. Her favourite activity is stealing her big sister’s stuff (toys, books, bookmarks, … anything really) and running off to hide it. You’d think no one ever paid her any attention. Shot indoors with off-camera flash bounced off an umbrella reflector. Black and white conversion done with Silver Efex Pro. This is a beautiful portrait, very natural. Great portrait and I like how it is more of a “White & Black” than a “Black & White” if you know what I mean. great portrait, I love the simplicity of it.